Khemraj was admitted to NHEDF at the end of May. He is a young man from a poor family who lives with his mother and elder brother in a remote village near Gorkha which was the epicenter of the earthquake in 2015. He came to Kathmandu in search of a job and was able to find work collecting rubbish. 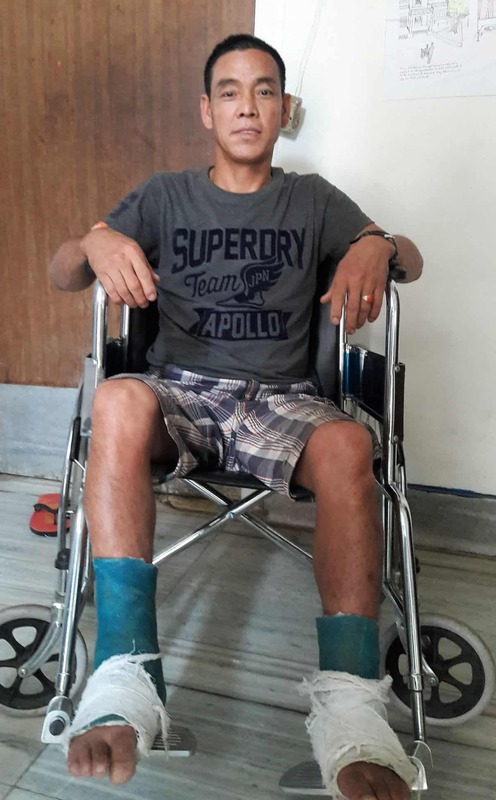 He was painting the outer wall of his landlord’s house and fell off a ladder badly breaking both his ankles. He was treated in hospital in Kathmandu but like all NHEDF’s patients, he could not afford ongoing medical expenses. Some villagers from his home town had heard of NHEDF and he was admitted to the Shelter. He needs ongoing medical care and physiotherapy and his anticipated length of stay is two months. Whilst he is at NHEDF he has shelter, support, free medical care and physiotherapy which will help him have a future and minimize the physical, social and economic impact of his injury. All NHEDF’s patients need your support. It costs about $10 a day to keep a patient at NHEDF and that is without medical costs…..
Next Next post: Meet Prakash who really needs a bone marrow transplant at a cost of $25,000!